New Rocna Anchor – It’s a Boy! One of the things on our "List of Things We Eventually Want For The Boat" was a new anchor. We really wanted a Rocna. I'll spare you all the details, but people LOVE these anchors and swear they work better than any other. We have nothing against the anchor that came with our boat and it's always worked well for us (we've got a Lewmar claw), but after reading some of the poetry written about the Rocna, well, we longed to feel that kind of love. A local marine supply company (Fisheries Supply, based on Lake Union) had Rocnas for sale at the boat show for a special "Boat Show Price" which was a bit below the regular price. On Saturday morning (the last day of the boat show) we measured our bracket and windlass (the thing that holds and lowers the anchor from the bow), and took photos that included the tape measure so that we'd have the numbers we needed. Between our two Saturday seminars (one on Anchoring, and one on Cruising the South Sound, which we're now doing…hi from Tacoma!) we stopped by the booth to figure out if a Rocna 20kg would fit our current bracket setup. It looked like it would, and it also looked like they (1) had one at at show (out in the truck), and (2) did not want to take it back to the shop, so we got an even deeper discount. Score! 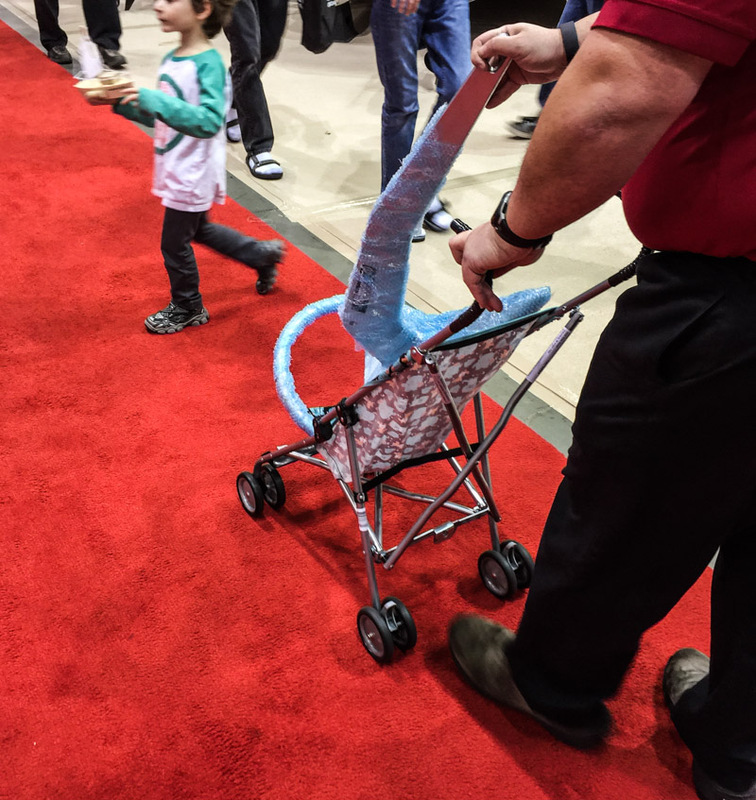 The salesman told us that the boat show folks weren't allowing hand trucks on the show floor while the show was open, and that he'd picked up a $20 baby stroller at Fred Meyer so he didn't have to carry anchors out to people's cars. (Smart!) 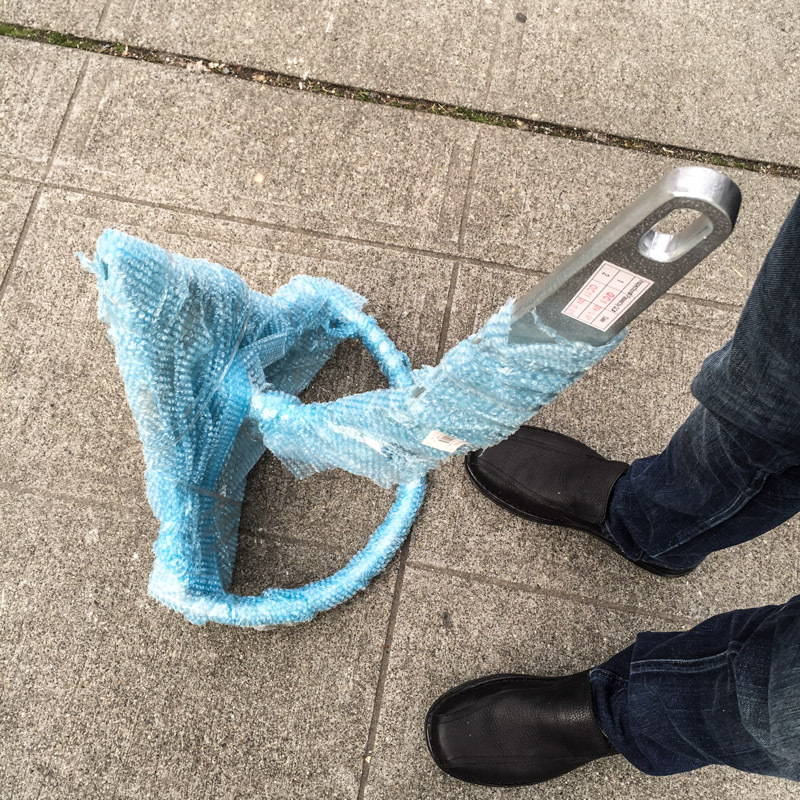 We followed him as he got our anchor from the truck (covered in blue bubble wrap…it's a boy!!) 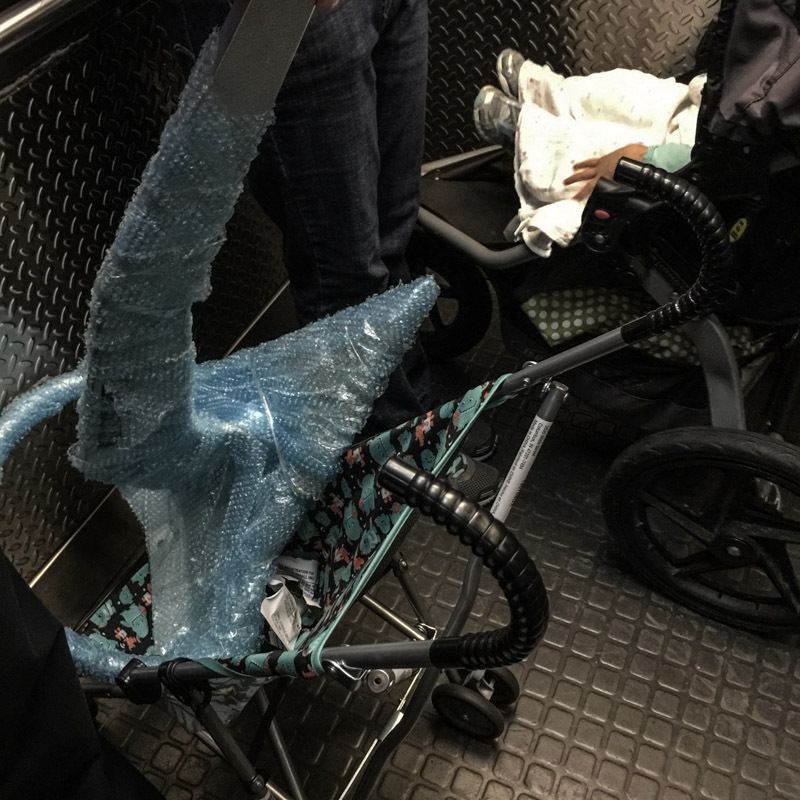 and then as he wheeled it in its little stroller through the gigantic stretch of boat show madness out to the front of the building. 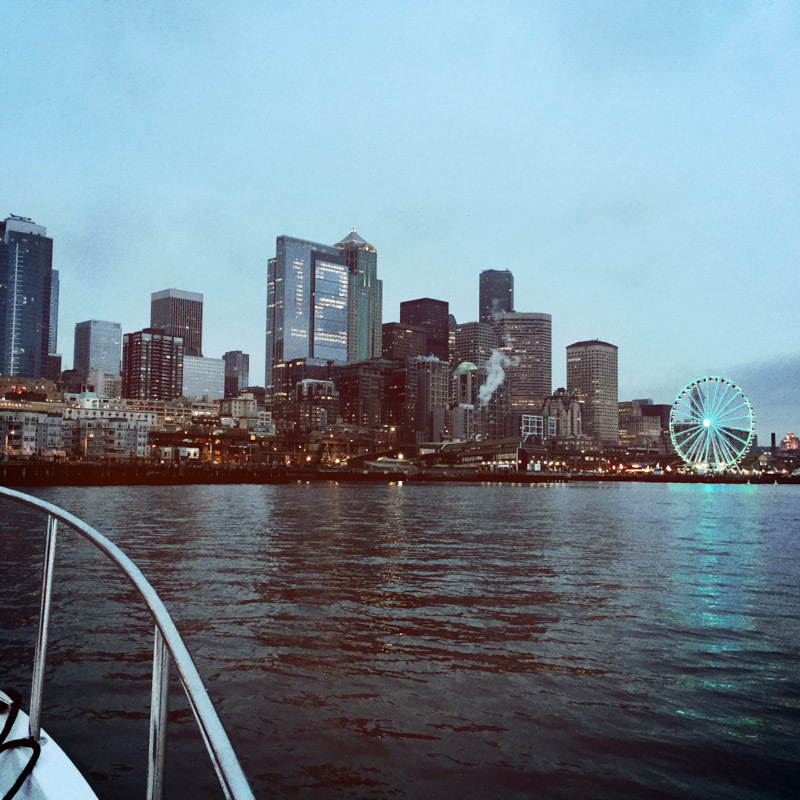 We took our new addition back to the boat and then had a quick bite to eat with Kathy and Pete and their son Kyle, and then we took Kathy and Pete for a short cruise out in the Sound. After our little cruise, we hung out on the boat for a bit, and then met up with two more friends (hi Kara and Dean!) for dinner over at Poppy (which was delicious). 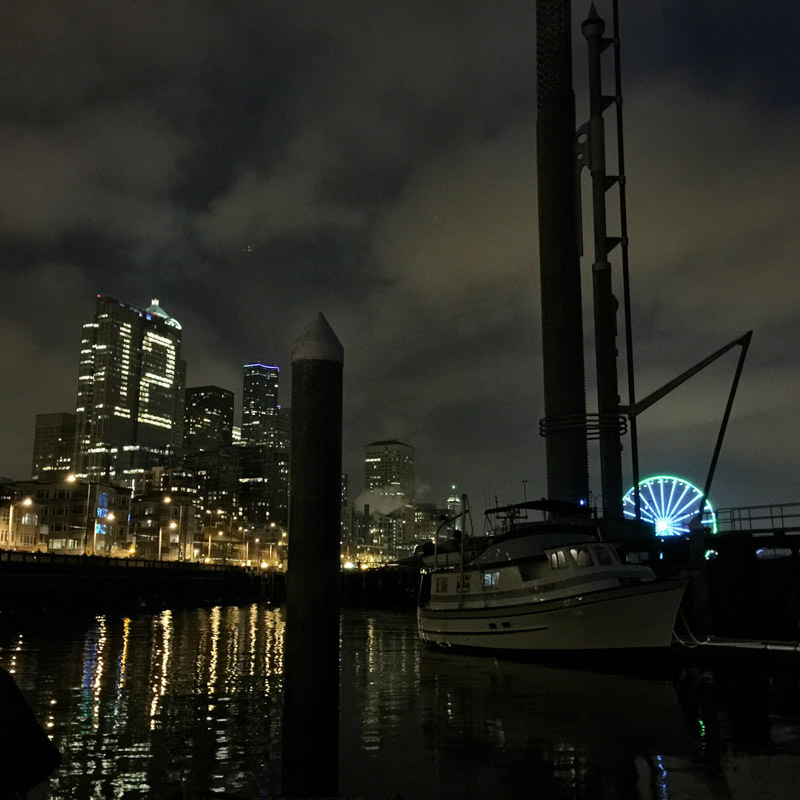 We had a great night with tons of laughs, and got back to the boat for another nice view of downtown.